Hello All and Happy Monday! Hope you had a wonderful weekend! Ours was full of baseball, softball, gardening and sitting on the couch doing absolutely nothing. Perfect. The other day I was having a serious craving for chocolate and peanut butter. I mean, it was weird. I mentioned a while ago we were planning on expanding our family and so I was secretly hoping it was some pregnancy craving. No baby yet, but that didn't stop me from eating every chocolate and peanut butter combination I could get my hands on. I had a peanut butter chocolate chip granola bar, a Reeses peanut butter Easter egg cup, skinny cow chocolate clusters dipped in...you guessed it...peanut butter. But it still wasn't enough. I needed MORE! 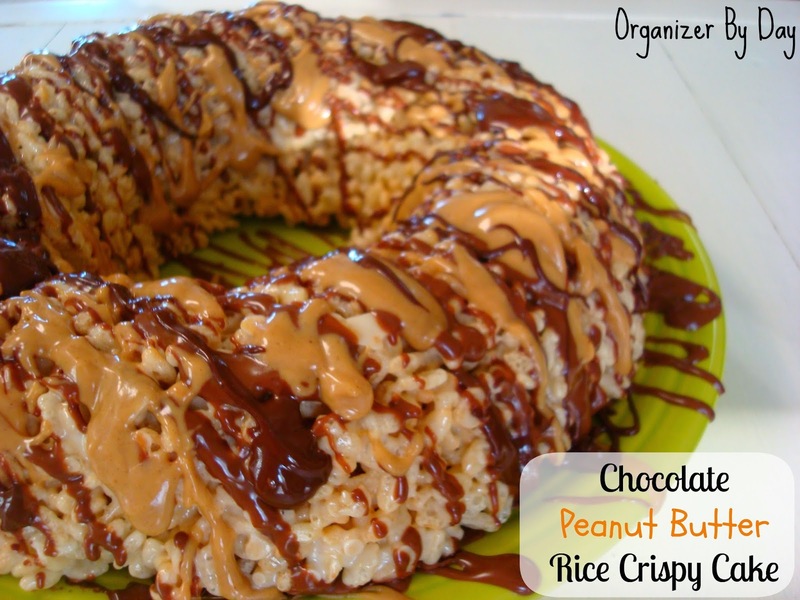 So I opened up my cabinets and started digging until I found everything I needed to make a Chocolate Peanut Butter Rice Crispy Cake! This thing is amazing! I can't stop eating it. 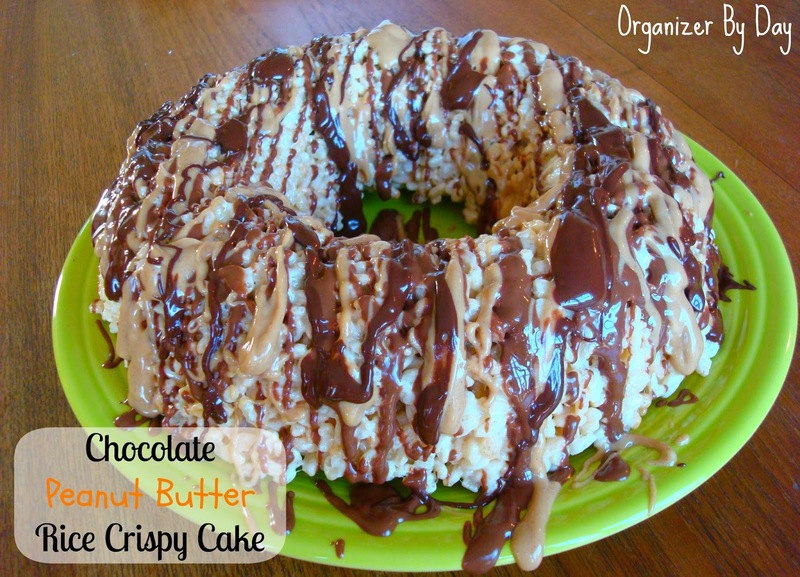 It has melted peanut butter, melted semi sweet chocolate and a combination of melted chocolate and peanut butter drizzled over the top. It gave me three super shiny pretty colors to top this great cake off with. All I did was turn over a bundt cake pan, made my normal rice crispy recipe, let it set, and topped it with the melted sweet goodness. Boom. Done. Grease a bundt pan really well and set aside. Melt the butter in a large pot on low heat. Add in the marshmallows and vanilla and stir with a non stick spatula until all the mallows are melted. Stir in the cereal until evenly coated. Pour into the bundt pan and press it down with buttered fingers or buttered wax paper. Let it set for about an hour. Turn bundt pan over and the cake should slide out. If it doesn't, try running a knife along the edges. In a small bowl melt the chocolate chips (except for 1 Tbsp) with 1/2 Tbsp shortening. In another small bowl melt the peanut butter (except for 1 Tbsp) with 1/2 Tbsp shortening. Then add the remaining chocolate chips, peanut butter and shortening together and melt together in another small bowl. Each one took about a minute, stirring halfway through. Drizzle each one over the cake until you have as much as you want. Do not place in the fridge to harden the chocolate. This will be served "wet" as in the topping won't harden. My experience is if I put rice crispies in the fridge they harden up and aren't enjoyable to eat. I am going to have to do this next time I am asked to make a cake and don't have a lot of time. So did you all have a great weekend? Anyone do anything new and fun? Let me know! I love rice krispie squares! This is a great idea. Thanks for sharing with Simple Supper Tuesday. This is so pretty and sounds delicious! Stopping by from Simple Supper Tuesday. I love absolutely nothing days! Those have to be my favorite kinds of days. I'm in love with this peanut buttery creation! This would be perfect for people who don't like traditional cakes! Yum! Coming by from The Wonderful Wednesday Blog Hop and just featured your post on G+ and pinned it! This looks AH-mazing! I had something similar on vacation last week, but it had a butterscotch mixed with the chocolate on top. Pinning it!! Oh my! I think I need to go make this right now! Never thought of doing it this way! Oh my word this looks tasty!! whoa. now THAT looks good. Oh my goodness! That sounds amazing. Thanks for linking up with Hump Day Happenings. That's pretty cool. A nice and unique way to "dress up" rice crispy treats! oh my gosh this looks so good. I have to make this. Thanks for linking up at Tell Me About It Tuesday. We hope you hop over and share with us again next week. Oh my gosh. This looks delicious!!! What a great idea. This is so easy to make! And it looks absolutely delicious! What a creative idea! Definitely going to have to try this deliciousness! So simple and yet decadent! Coming over from frugalCraft Home Blog Hop. Never thought about making them into a cake. Great job! You have brought rice crispy treats to a new level. Thanks for sharing on foodie friday. Pinned. 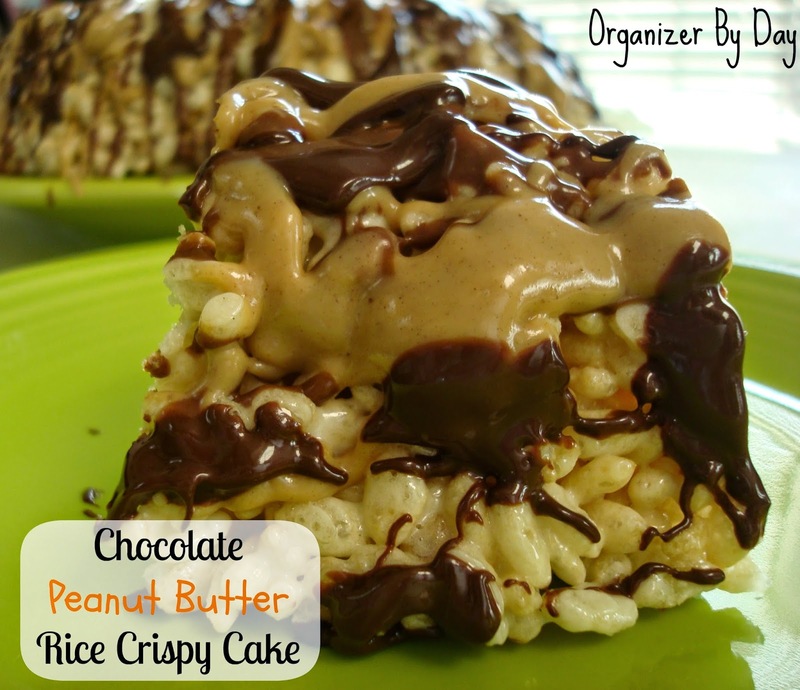 I used to make chocolate peanut butter treats using the rice krispie treat recipe but using Cocoa Krispies, and add a 1/2 or so of peanut butter when melting the marshmallows. Rice Krispie treats are always a wonderful treat but you just took that recipe up a notch. I can't wait to try these.